Whale Beach SLSC - the next generation! Picture: Whale Beach SLSC Members at Christmas Carols 2013 ( being photo-bombed by a 3 and 5 year old while trying to get just one photo!) - picture by AJG. Whale Beach SLSC was first formed by local residents and holiday visitors in 1929 and since then has protected and served those who live in Whale beach and surrounds and all who visit this beautiful tucked away cove. 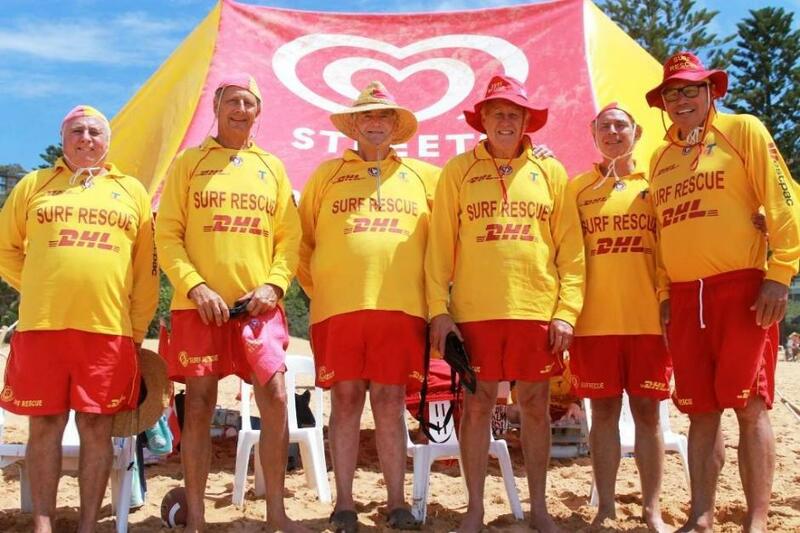 As many of those we spoke to will attest being part of surf life saving is actually thinking you're going to be giving and finding that you are receiving more than you give. If you have been stuck indoors in a chair all week, you find you are suddenly somewhere where the air and salt water surrounds are beneficial. Add to this you will be doing some exercise and suddenly that sprint you could do as a five year old is coming back. If you want to talk to someone about something other than work, work, work, you'll find that those who dwell in the reign of the democracy on the sand are similarly minded and more than happy to discuss anything else. If you have dreamt of you riding waves like a dolphin, this is the place to learn how. IRB's, skis or even simply building strength back into your swimming, saving the life of a person who has just collapsed by identifying what needs to be done and doing it through First Aid, this is where you will learn 'how to' - and these are just a few of the many ways those who serve, with a motto that includes 'Vigilance and Service' - find they are giving to something that gives more than just a little back. Whale Beach SLSC has always been and remains a place where some of the best younger members and experienced wisdom meet and where a focus on vigilance and community service prevails. Since its early years the club has seen many changes, the most recent being renovations to the clubhouse itself that have extended the club’s commitment to keeping the focus on service and being competent on the sand. In 2013 we attended the official opening of these new facilities at Whale Beach, built and paid for by members, one of only two surf life saving clubhouses owned by the members themselves, and recently revisited to see what the refurbishments are. The updates themselves, include a great new members lounge area, bunkhouses, showers and an open plan kitchen as well as a state of the art gym. Whale Beach SLSC also has a great new open terrace area on its bottom pavilion, replete with a great barbecue, and the view, anyone who has visited Whaley knows this is one of the best beaches in Pittwater with great banks south and north and centre of beach which pay truth to the local phrase ‘there’s always waves at Whaley’. Whale Beach SLSC, like all our surf clubs, operates all year round, not just during Patrol season. We spoke to Whaley member Rob Berry, the man who puts so much into the annual Big Swim, and he related he has a range of skis and would be happy to teach those not proficient in paddling how to. Can you imagine being out in the water at this time of year – the salty brine is still warm, the summer crowds have left the sand and returned it to those who live here and peace has descended into the valleys. While we were visiting two ladies, a mother and daughter, were applying to join having just moved to Whale Beach - they liked the new women's rooms! In coming months we will Profile some of the Life Members of this great old Pittwater surf club and this week share an insight into the club, clubhouse facilities and a few memories from members themselves as Whale Beach SLSC enters the last month of its 76th and 2014/2015 Patrol Season. There are Australian as much as Whale Beach Legends among the membership here. How did Whale Beach SL:SC form? It was formed by the Northbridge Water Polo side initially, they would come down here. My grandfather, Frederick James (John) Timms, bought a block of land at Whale Beach. He had a barn where all the people from Northbridge used to gather to have meetings. Finally they built a bigger and better one, and with the tuimber from the first he built a shack at Whale Beach. That formed the basis of the Whale Beach surf club. They had the old windmill on the beach next to the surf club. How long have you been coming here? All my life, I think I may have been conceived here. My father, who was also named Fredrick Timms, joined the Services. He met my mother, whose uncle owned a house just along here, and her father, surname of Newlands, gave us some money to buy the land for the first surf club. So I have associations on both sides of my family. While dad was overseas during the war I used to come down here and the old fellow, who hadn’t gone overseas, would look after me. I’m 73 now. This is my 60th year doing patrols. Hal Bailey found a fossilised fish – an indigenous peoples carving here. My grandfather said that when he first came down here there were lots of goats and carpet snakes. Mum Webster, Graham Webster’s grandmother, she used to leave a saucer of milk out for them. My grandfather Steve Newlands, he gave us the money to start the club had a great mate, Ludiwisi who owned tanneries and he would make these beautiful big carpet snakes into wonderful belts. The Ludisiwsis are still going, but out of tannery business now – they had the biggest one around Sydney then though. Richard Stewart: Did Colin Timms tell you about a rescue he was involved in as a 13 year old – he rescued three people and received a commendation from Surf Life Saving – Colin could tell you about one in 1939 – there was a boat with three fishermen in it, and Noel Greenfield got a medal for bravery for that one. How long have you been coming to Whale Beach SLSC? I’ve been a member only two years. I love it, and I love the place. Bill Phillips is an old friend of mine and he got me to join. I actually learnt to surf up here when I was a kid, so it always held these wonderful memories and I thought I’d relive those. I get to do a bit of swimming as we need to be out among the swimmers and to take a board out now and again, so it’s excellent really. I’ve won my age group in the Big Swims a few times, I was always a passionate swimmer. What inspired you to join a Surf Club as a matured aged man? Well, I’m getting fit again through the swimming and it’s an appointment to come here to the beach when I’m on patrol. I find I come up every other weekend anyway as I miss the place. It’s one of the most beautiful beaches in Australia I think, it still has that country feel. It’s a beach surrounded by state forest from the ridge and retains that real holiday feel about it. How old were you when you first came to Whale Beach? I was 8. I’d come up on the bus, and when I got a board I learnt to surf out at the Wedge. I just turned 60. I’m getting so fit here, I’m in squad again – my coach is one of the guys I trained with when I was a kid, so it’s all coming back home, and coming back to Whaley is also like coming home every time I come here. What are the most dramatic changes you’ve seen here? Bigger houses instead of the beach shacks, I’d prefer to see a hillside of beach shacks, but as it’s such a beautiful place you can’t blame people for wanting to build these magnificent houses. View from new upstairs 'wave' balcony. How long have you been coming to Whale Beach? Since 1982 and I’ve been involved in the Surf Club since then. I was a member at Newport Surf Club prior to that. I’ve been around the Northern Beaches for a while. My parents had a weekender at Clareville and I bought a weekender at Whale Beach in 1982. I’m 71 now, a 1943 model. When did you first get into the water? When I was about 5 or 6 – my father was involved with swimming as well so I’ve been swimming all my life. I got my Bronze in 1959. so I have my 50 year membership of the Surf Life Saving movement. It’s the favourite organisation that I’ve belonged to because obviously I like it and like swimming, the community and the service that you do, it’s been wonderful. Have you done any competitive swimming? Yes I have. I was a competitive water polo player and played for Australia from 1964 until 1968. Did you play for Australia in the Olympics? Yes – we played in the 1964 Olympics. We qualified for 1968 and went to Mexico but didn’t actually compete. I was in the Australian Team for those four years. A wonderful experience. The fact that I was meeting people from all over Australia was wonderful. In our team there was someone from Western Australia, there was someone from every state really and we’re still friends, still having reunions. We had a 50 year reunion for Tokyo and we’ll be having another reunion for the 1965 Tour we did. I was also in the Australian Universities Team for 1963 which went to New Zealand, so we’ve kept in touch with all these people we’ve met along the way in the different states through sport. You meet so many different people from the Australian Championships and from the Australian Teams. 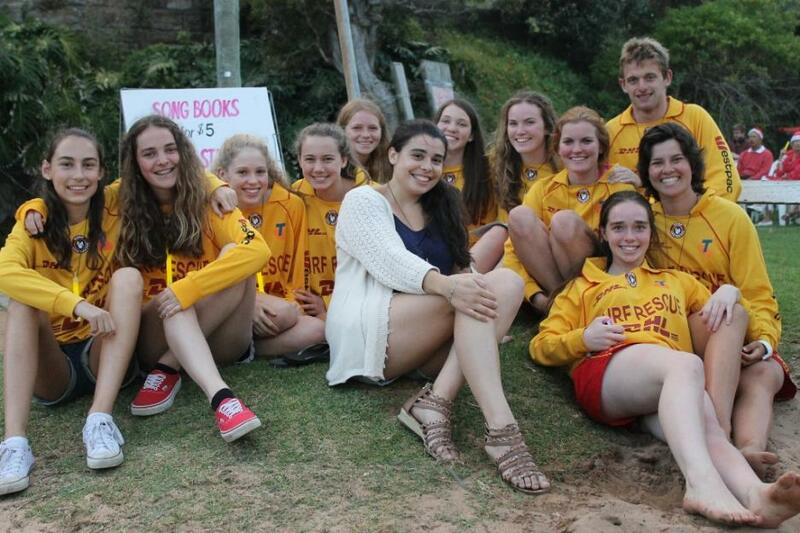 What’s the best thing about being a member of Whale Beach SLSC? The fact that members are from all walks of life within the community, both young and old. I like that it’s amateur, no one gets paid. 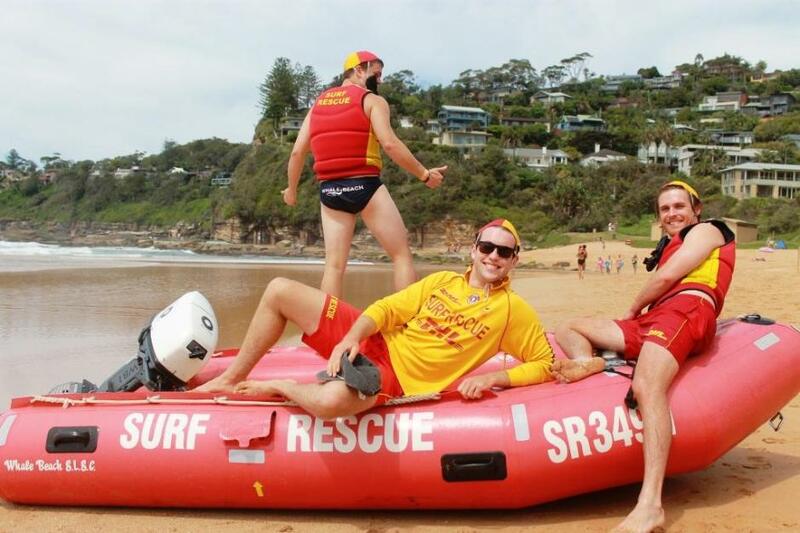 The fact that you’re doing a service for the community and being part of the spirit of Surf Life Saving – it’s just fantastic. When did you join Whale Beach SLSC? My brother has been a member from the age of 14. I wasn’t a member in those early days. We’ve been coming down to Whale Beach since I was 5. I’ve been the Honorary Doctor for the club for 30 years or more and it seemed when I was in my 50’s that I had a bit more time and so I did my Bronze at the age of 57, with a mob of 16 year olds, and for the last 12 years I’ve been a formal part of the Grey Whales patrol. What’s the best part about being part of this club for you? There are many things; I’m addicted to the ocean, I swim and body surf just about every day. I swim with a tribe of retired and semi-retired friends who swim at 7 a.m. all year round at Whaley. I join them on weekends and occasionally during the week as I’m still working full-time. So there is tat aspect of being part of the surf and with friends who are doing this. It’s good to do some community service, I think we all should do that. you definitely get more back from doing community service than you do in giving. As somebody much wiser than me once said ‘we get in order to make a living, we give in order to make a life’ – so the community service is absolutely important and that is predominant as the culture in the club. This is not a highly competitive club so people are not members here primarily to compete. That is a quintessential part of our Australian culture, and has been part of this club in the past, but at present it’s primarily we love the beach, we know the dangers, this can be a particularly unsafe beach for people who don’t know the surf, whereas we are familiar with it and can make a difference. I live down here now too of course, so that makes a difference as well; it seemed selfish to live in the area and have greater access to the beach than those who travel up from the city and not do patrols, not contribute. The final reason is my beloved brother, the best brother any bloke could have. He’s four years older than me and has always been there as a support and a mentor and a protector since I was four years of age and knew a bit about the world and remembered it. now that has moved away from here we may get together on other occasions but we always get together on the morning or afternoon when we do the patrol. What are the most dramatic changes you have seen occur here? The most dramatic change about the beach is the beach itself and the surf. That changes overnight and during my time here I have seen the beach in all of its shapes – there was a time when there was so much sand out at the northern end that it looked like there was a separate beach. Richard was living here in May 1974 when the surf hit the surf club up there and demolished the sandstone boathouse that was on the beach. This was a very high surf that corresponded with New south Wale’s highest high tide ever and the two together almost removed all the sand from this beach. I love the surf and the ocean, and I respect it and remain fascinated by it – so those are two stand out changes. Demographically Whale Beach has changed a lot. This was a place where kids from the Western Suburbs came to. Palm Beach has always been a place where wealthier kids form private schools came to. Adrian Curlewis, after the first world war, recruited young men from St Paul’s college at Sydney University and fellow students at Shore, so that put that demographic stamp on Palm Beach. Richard and I both came forma private school but many of the kids we met here came from working class and lower middle class families, as was ours, our dad being a wholesale butcher. Whale Beach has started to have the same connotation of wealth and privilege that Palm Beach had when it became popular and now of course it has that set, not insignificantly of course the fact that most of the houses that have the postcode of Whale Beach face the ocean which is of course, the biggest determinate of house prices in Sydney, whether you’re looking at water or not. The fortunate aspect of that of course is it has brought wealth and philanthropic people to Whale Beach and these have contributed to the rebuilding of the surf club itself –we really wouldn’t have been able to complete these works without their generous support. We now have a facility that is second to none and able to support the interests of our younger members. The new clubhouse also has facilities for women which is particularly important as the old one didn’t, it dated prior to the times when women were allowed to be active members. So it was essential that it was modified to meet these needs. This surf club was rebuilt in one significant part to provide a facility that would accommodate young female as well as young male life savers. We’re very pleased that so many young women and men are joining the club. The best thing about Whale Beach and the surf club is that here too, when you get down onto the beach, everyone is equal. That remains unchanged. 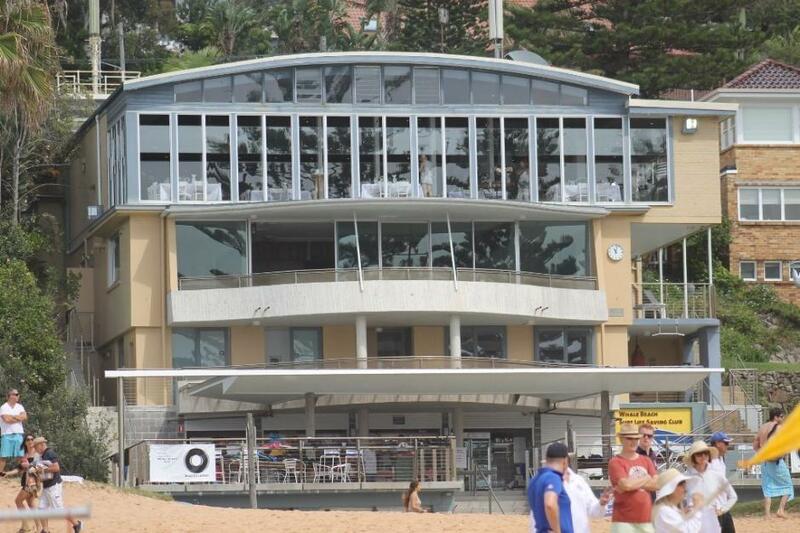 Whale Beach SLSC members will continue to be in and around the clubhouse during the off-season. If you didn't want to dive in once the Patrol season was in full swing but want to find out 'how to', now would be a great time to take that first step. 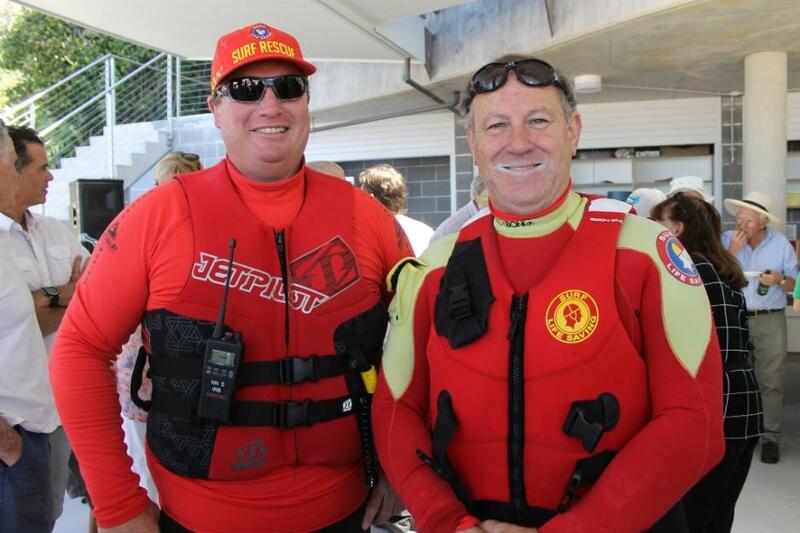 Glenn Jones and Geoff Hale showing what it's all about - being on Patrol and Saving Lives. Copyright Whale Beach SLSC, 2015.